The rigid quarter-inch (6 mm) steel deck, formed side plates, and heavy-duty skid shoes provide solid strength and durability. The Rotary Cutter operates in forward or reverse. The double-edge blades, fast blade-tip speed, and tapered side-discharge chute ensure clean cutting and maximum material shredding. The RC78 cuts and mulches up to 4-inch-diameter saplings and heavy brush. 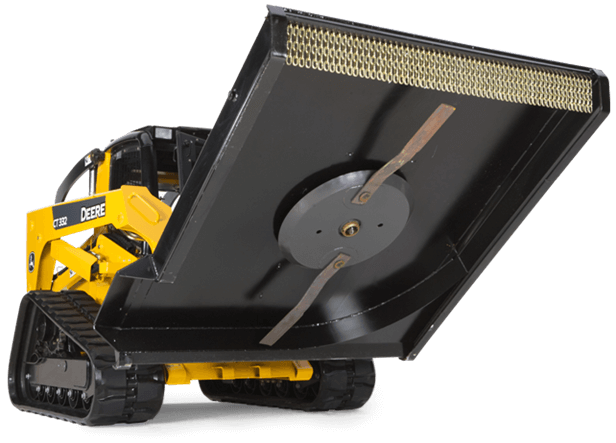 Like all Worksite Pro attachments, these rotary cutters are optimized to work with John Deere skid steers and compact track loaders. In addition, they're compatible with most comparable competitive models.